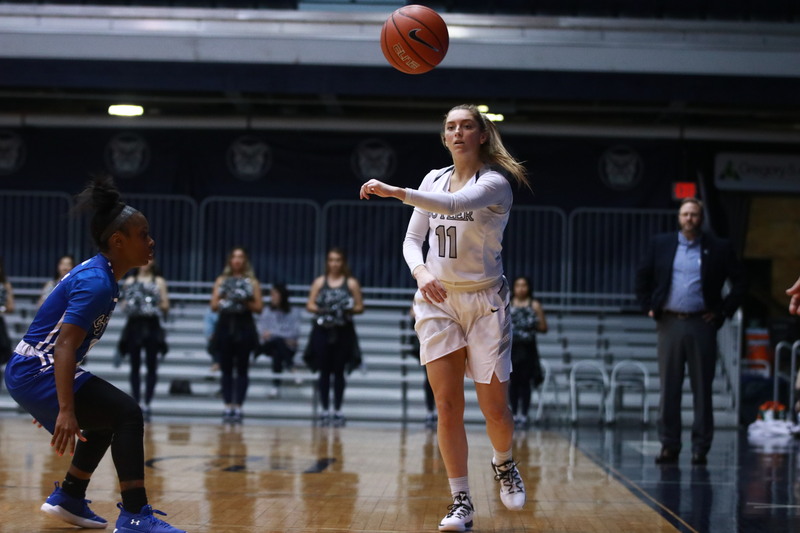 Michelle Weaver makes a pass at Hinkle Fieldhouse. The Bulldogs are currently in Charlie Creme’s “first four out” of the NCAA Tournament. Jimmy Lafakis/Collegian file photo. At 17-5 overall and 7-4 in Big East play, the Butler women’s basketball team has its best record since joining Division I, but that doesn’t guarantee a spot in the NCAA Tournament. After losing three out of their last five — one by eight, one by 21, another by 29 — Butler needs to build a better resume in their final seven-game conference stretch. Butler is second in the conference behind an undefeated Marquette team and in front of DePaul, who is 6-4. Beyond that, Seton Hall and Villanova are 6-5 while Georgetown and Providence are 5-6. If Butler squeezes into the NCAA Tournament, it will be their second appearance all-time and first since 1996. Butler’s next five games are against teams it will be prepared for, having played them earlier in conference play. The next three games are must-wins for the Bulldogs. In the first two, they play Xavier and Creighton, two teams they beat by an average of 27 points in their prior two matchups. Xavier and Creighton are must-wins because the final four teams are tougher matchups. Make no mistake, the final stretch will provide a clearer image of Butler’s NCAA Tournament chances heading into the conference tournament. Three of the final five games are against teams they’ve previously lost to this season — Providence, Marquette and DePaul. The past paints a grim outlook for the future. Since Butler officially joined the Big East in 2013, the conference has received the least amount of bids of any major six conference — ACC, Big Ten, Big 12, Pac-12, SEC and Big East — in the NCAA Tournament. Four Big East teams made it last season, three teams each in both 2017 and 2016, and two teams each in 2015 and 2014. If they lose the easy games, the past doesn’t help Butler’s NCAA tournament cause. Each Big East team who received an at-large bid in the last five years has boasted at least 12 wins in the conference, except Creighton last season, who won 11. This means Butler has to win at least four out of the next seven to have a chance, and six to feel somewhat comfortable. If not for an easy nonconference schedule, Butler could be in a better situation. Though the Bulldogs won 10 out of their 11 nonconference games, only one team they beat, Akron, now boasts an overall record over .500. Even then, Akron is 3-5 in the Mid-American Conference. That leads to another issue for Butler’s nonconference slate — the conference records of their opponents. Western Illinois is the only team Butler beat in the non-conference portion of its schedule that is over .500 in their conference. Overall, Butler’s nonconference opponents have tallied a 108-119 record, a .475 winning percentage. According to Charlie Creme, a bracketologist for ESPN, Butler is one of the “first four out” of the NCAA Tournament as of Feb. 4. Also on the list are BYU, Auburn and Michigan. Creme utilizes RPI, which rates a team’s wins and losses based on strength of schedule, to seed the teams. BYU is ranked 34th in RPI, Butler is 45th, Auburn is 50th and Michigan is 55th. In terms of how the Big East stacks up, Marquette is seventh and DePaul is 37th in RPI ranking. Simply put, Butler is almost in, but needs more key conference wins to jump into the next tier and prove they are one of the few Big East teams who are tournament-worthy. The next tier is the “last four in.” Creme’s shortlist of the last four in includes Purdue, Buffalo, Tennessee and West Virginia. Purdue is 44th in RPI, Buffalo is 25th, West Virginia is 62nd and Tennessee is 57th. It’s a tight race, with little separation between the last four in and the last four out. Even a historic season doesn’t render the Butler women’s basketball team a shoo-in for the NCAA Tournament. Butler will need to finish Big East play with more than a few key wins to be considered for the NCAA Tournament, and even then, nothing is promised. A win or two in the Big East Tournament wouldn’t hurt either.